On a low ridge is the battle monument of Sardarapat*, commemorating the Armenian defeat of an invading Turkish army, May 20-22, 1918. The Turks, coming south down the railroad from Alexandropol (Gyumri), were pushed back, giving the wavering Armenian provisional government the encouragement to declare the independent Republic of Armenia on May 28, 1918. 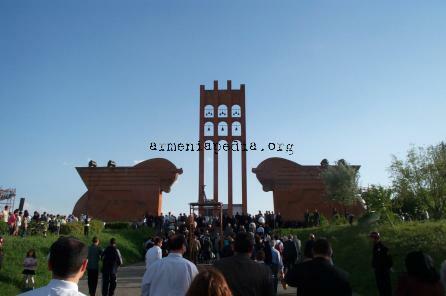 The monument is guarded by massive Assyrian-style winged lions, and is flanked by a memorial garden for Karabakh martyrs. Bearing left before the monument, a driveway skirts the monument ridge to reach a tourist pavilion (refreshments) and the highly attractive Sardarapat museum**. The ground floor central hall contains commemorative material from the battle. Starting from the right, the lower galleries present archaeological materials from Neolithic to Medieval, and implements for various traditional handicrafts. Upstairs are exhibits of carpets and embroidery, modern Armenian decorative ceramics, and jewelry. Information from the Rediscovering Armenia Guidebook. The Sardarabad Memorial is located 25 kilometers from Echmiadzin. In violation of the Brest-Litovsk Peace Treaty with soviet Russia, Turkish troops crossed the border in 1918 and attacked Alexandropol (Leninakan). The aggressor intended to crush Eastern Armenia and seize Transccaucasia. When Alexandropol fell, the Turkish Army poured into the Ararat Valley – the heart of Armenia. There was a major engagement at Sardarabad on May 22-26, where the Turkish Army was defeated and retreated. A memorial park was laid out on the battlefield in 1968. The entrance is flanked by huge winged oxen made of red tuff. A flight of steps leads to a square from which a 26-metre-high bell tower rises. The beautiful trellis structure with its nine bells can be seen from afar. The bells ring every year on the day of the historic victory. A lane of eagles, symbolizing the spirit of the fearless fighting men, leads to a curved Wall of Victory (length – 55 meters, height – 7 meters) with scenes of the battle, and the figure of a woman with a child – a symbol of revival. The Sardarabad complex includes a restaurant and a cozy little hotel. The complex was designed by the architect Rafael Israelyan, and sculptors Ara Arutyunyan, Samvel Manasyan and Arsham Shaginyan. Visitors are also welcome to drop into the Museum of Ethnography of Armenia on the territory of the park. tRam shaped tombstone from Hin Jugha on display at museum. This page was last edited on 15 October 2010, at 21:54.